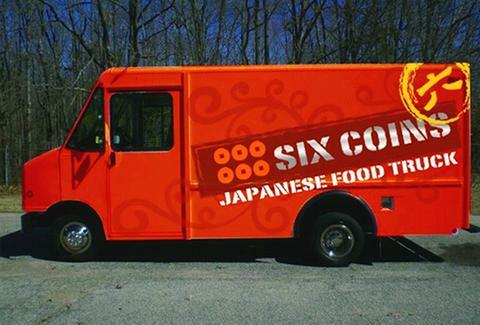 If you've got six coins, you're either the richest person in kindergarten, or you're scarfing Japanese street food from a vivid red mobile-eatery that's making its South Lake debut after a few weeks on the Eastside, and is called... 13 Coins! Just kidding, that name's the worst, it's Six Coins. To start, there're three-piece sushi rolls (California, shrimp tempura, etc.) they're calling a "Little Adventure of Ours", which you can top with a spicy mayo sauce or chili for "A Little Kick On The Side", not to be confused with the title of Shawn Kemp's autobiography, A Little Kid On The Side. SC's also slinging rice box options like sweet & sour pork stir fried w/ crispy green onion, yam & mushroom, and they're slow-cooking a "Signature Curry", two words Isaiah Thomas really, really regrets saying to Eddy. If you can't decide what to get, you may have an anxiety disorder and should seek a doctor's care, or just turn one sushi and one rice box item into a combo and save yourself a whole dollar, then parlay that cash into a spot at the good table during arts and crafts.